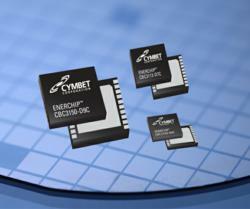 Cymbet Corporation today announced the availability of the EnerChip™ CC CBC3105 smart solid state battery. The CBC3105 combines the award winning EnerChip battery with integrated input power conversion, battery management and regulated output capabilities. The Cymbet EnerChip™ CC is a smart rechargeable solid state battery Uninterruptible Power Supply (UPS) in a chip that provides power backup to microelectronic devices when main power fails. Cymbet Corporation today announced the availability of the EnerChip™ CC CBC3105 smart solid state battery. The CBC3105 combines the award winning EnerChip battery with integrated input power conversion, battery management and regulated output capabilities. The Cymbet EnerChip™ CC is a smart rechargeable solid state battery Uninterruptible Power Supply (UPS) in a chip that provides power backup to microelectronic devices when main power fails. The EnerChip CC provides power supply monitoring and switches over to the internal solid state backup battery when the supply drops below a set threshold. The EnerChip CC product family can provide anywhere from several hours to several weeks of backup time. Cymbet Corporation is the leader in solid-state energy storage technology. The company is the first to market eco-friendly rechargeable storage devices that provide embedded systems designers with new embedded power capabilities. The company's EnerChip™ solid state batteries with integrated power management enable new concepts in energy storage application for ICs and new products for medical, sensor, RFID, industrial control, communications and portable electronic devices. Visit Cymbet online at http://www.cymbet.com.